If you have more than one email account, you know what a royal pain it can be, remembering login URLs and passwords and using various webmail apps to read email. I use Microsoft Outlook at work, but have only recently begun to use it at home – to simplify and organize this nonsense. If you’re wondering why in Hades anyone needs more than one email account, and you’re tempted to ask me if it wouldn’t just be simpler to consolidate and get everyone using the same one – well…no. Think about it. I have one primary work email and one primary personal email. That’s easy enough: work for work, personal for home – and never the twain shall meet. But I recently volunteered to Chair two categories in the 2014 OWFI Annual Writing Contest, which gives me two more. And I have one or two for testing purposes, but with several domains, I could (in theory) have an unlimited number. Yeeesh. I don’t want that many. But I really don’t want to have to remember multiple URLs and login IDs, and I’d very much like to do all my personal email from a single, consolidated console with one user interface. And what if I want to put different signature lines at the bottom of my two Category Chair emails, so no one – from entrants to judges to me – gets confused? Maybe I want to include my phone number on those, but not on every email I send out from my personal account, by default. 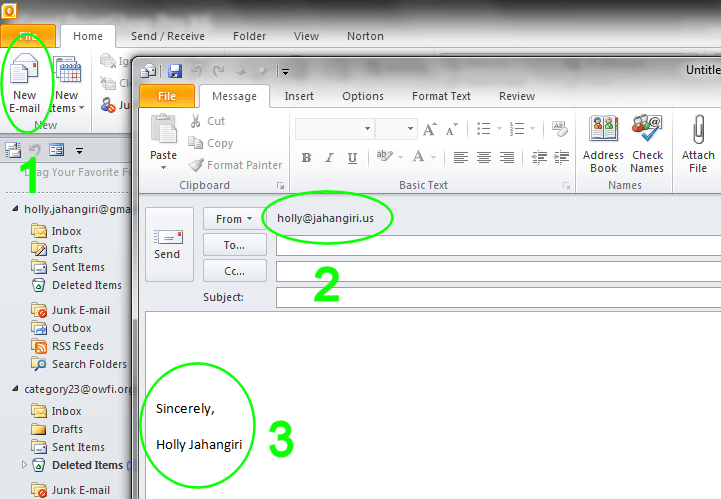 This assumes you already know how to set up multiple email accounts in Outlook. If not, let me know – I’ll write that one up later. Click Signatures (1), then click New (2). Enter a name to identify the new Signature (3) and click OK. Select from the drop-down list the Email account to link the selected signature to. Select from the New messages drop-down list the name of the signature you want to use for new email messages you create and send from the address shown in Email account. Select from the Replies/forwards drop-down list the name of the signature you want to use when replying to or forwarding emails from the account shown in Email account. In the Edit signature box, create the signature you want to include when using the signature you selected in Select signature (4) to edit. You can use some basic formatting, add a vCard, and include links and images. It’s probably best to keep images small, as a courtesy to recipients. When you are happy with it, click OK (7). 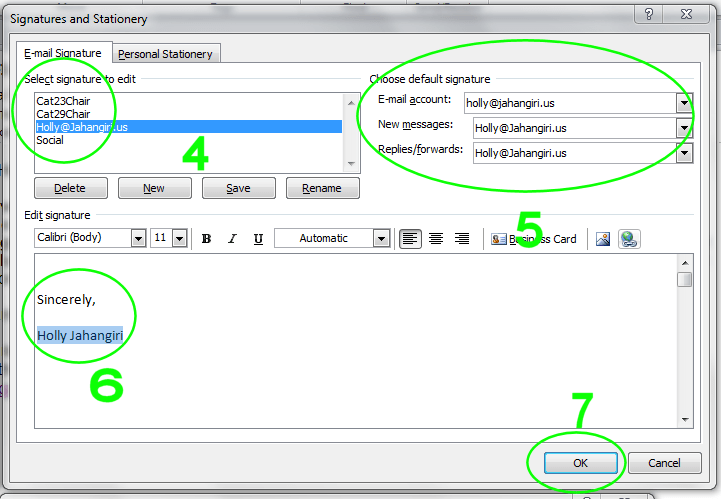 NOTE: These instructions combine creating, editing, and selecting default signatures for one account. Repeat for each account. You can also create multiple signatures and use a different one for new emails and for replies/forwards on a single account. The steps to do this in Outlook 2013 or 2016 should not be significantly different.